Enjoy the freedom of a mobility scooter designed with your comfort in mind. This Shoprider Sovereign 4 Mobility Scooter is a four wheeled disability scooter designed to make regular journeys a safe and comfortable experience. 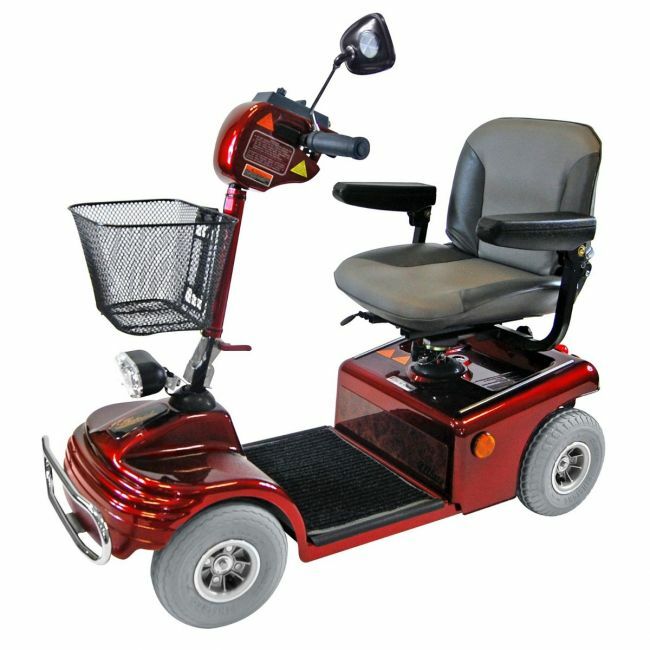 The high quality metallic red finish and chrome bumpers make it one of the more stylish and aesthetically pleasing electric mobility scooters in the UK. It's practical too, with a generous shopping basket to carry personal items when on the move, and a maximum range of up to 20 miles per charge at 4mph. Padded seating and backrest offers maximum comfort, and the five position tiller adjustment allows you to easily alter your scooter to the ideal driving position. The sliding and swivelling seat makes it easy for those with limited mobility to get on and off, and bright front headlights ensure visibility even in low light.